Gearing up for Day of the Dead and a FREE banner! Whether or not you actively celebrate El Dia de los Muertos in your Spanish classes, it’s nice to decorate! 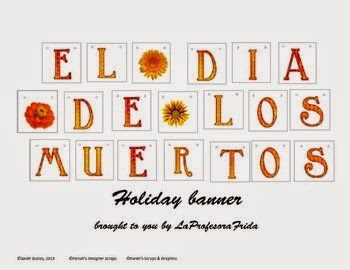 La Profesora Frida has a FREE Day of the Dead banner for you to download in her TpT store! Pretty Day of the Dead colors and Day of the Dead flowers adorn this lovely banner. Download it now for free! What kinds of Day of the Dead activities do you use in your classroom? Sugar Skulls! Calaveras are SO beautiful and such a BIG part of El Dia de los Muertos. I just found a lovely short film about Sugar Skulls on YouTube. Such a poignant little film that brings the “why” of sugar skulls to life. This would be a beautiful film to show your students to help them understand this cultural icon. –Up for making some Sugar Skulls with your students? I just found this Sugar Skull Mold sheet for sale at Crizmac. Make sure to try making a Sugar Skull at home first so you can help your students with theirs! –Not up for the mess of making Calaveras with your students? Download some free Sugar Skull coloring pages for a mess free way of decorating. Ofrendas. I started offering Ofrenda creation as an extra credit activity for my Spanish students because I actually had one mother call in to complain about the religious significance behind it, even though I explained that we were studying the culture not the religion, she didn’t want her daughter to participate in the activity. Which is ok. Which is why I started to offer it as an outside of class, totally up to you, extra credit option. –And boy oh boy have I gotten some neat submissions! 🙂 One year a student made an Ofrenda for his favorite musical artist who had passed away. He had a hidden compartment where he could hook up his iPod and speakers that played the music of the artist! Neat! How about you?? What kinds of activities do you offer in your classes to celebrate El Dia de los Muertos with your students? If you download my FREE Day of the Dead banner, please remember: Positive feedback makes my day! 🙂 If you enjoy this banner, please take the time to leave a nice rating/comment. http://thestressfreespanishteacher.com/wp-content/uploads/2018/08/Eyes-and-Glasses-300x149.png 0 0 admin http://thestressfreespanishteacher.com/wp-content/uploads/2018/08/Eyes-and-Glasses-300x149.png admin2014-09-28 13:22:002014-09-28 13:22:00Gearing up for Day of the Dead and a FREE banner!